On a night where they visited Buffalo, the Rangers got exposed. In truth, they were no match for the Sabres’ speed which was dominant at five-on-five. The score didn’t reflect it. But eventually, Jack Eichel changed the script by scoring the tying and winning goals in a well deserved Sabres’ 4-3 win over the Rangers. If not for a couple of power play goals from Ryan McDonagh and Rick Nash, it probably would’ve been a blowout. Rare is the game where the Blueshirts have looked over matched. It happened at home against the Penguins. Only Pittsburgh won much bigger. The Sabres are still in the rebuilding process. They were without key defensemen Zach Bogosian and Dmitry Kulikov. They relied heavily on top blue liner Rasmus Ristolainen, who logged over 26 minutes. Jake McCabe and Cody Franson also played roles as did Josh Gorges. How bad were the Rangers at even strength? They got outscored 3-1 and outshot 31-15. The Buffalo fore-check was relentless. They used their superior speed, size and strength to keep the defense off balance. Dan Girardi had his worst game of the season. On for two goals against and a noteworthy 38 shots against, he was too slow. Never was that more evident than on Eichel’s winner which came with 5:32 left in regulation. Evander Kane blew by Girardi like he was a statue. 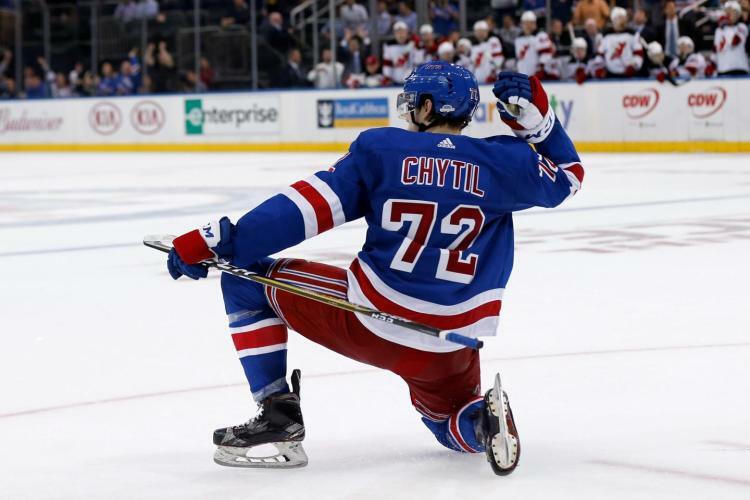 Henrik Lundqvist, who had his own struggles, fell down and watched as Eichel centered a pass for Kane that banked off a standing still Mats Zuccarello and in. It really was indicative of how the game was played. The Rangers had no answer for the Buffalo top line of Eichel, Kane and Sam Reinhart. They got pinned in their zone for long stretches and survived only due to Lundqvist, who wasn’t good allowing four goals on 34 shots. In a way, he kept them in it by making some very tough saves. But you can make a case that all four goals he gave up were questionable. It started badly when just 18 seconds in, McCabe sent what looked like a harmless dump in from the red line that went off Johan Larsson’s skate taking a funny hop over a startled Lundqvist. The only period they played well in was the first period. Despite the bad bounce, they outshot Buffalo 11-8. An overly aggressive Marcus Foligno reached out and grabbed Girardi for a hooking minor with under five minutes left. That allowed McDonagh to take a Derek Stepan feed and fire home his first of the season through a good Chris Kreider screen. A second Buffalo penalty on Franson for cross checking resulted in another Ranger power play goal in the second. On this one, Adam Clendening made a nice read at the left point. Playing for Kevin Klein, who was a healthy scratch due to recent struggles, Clendening fired a shot from the left point that booing target Jimmy Vesey got a piece of to force Anders Nilsson to leave a rebound. Nash pounced on it for his 11th to stay hot and give the Rangers a 2-1 lead at 8:15. But it was short lived. On the next shift, Buffalo came right back with a big shift from their checking line. Taking advantage of chaotic play behind the Ranger net, Foligno fed Brian Gionta, who buried one home with Lundqvist again out of position. On that one, Staal and partner Nick Holden got caught. Zuccarello was also on for it. He really had issues defensively. J.T. Miller and Matt Puempel also were on. Predictably, Puempel didn’t see much time afterwards. He only received nine shifts totaling 7:47 of ice-time. Oscar Lindberg also got only nine shifts (7:57) from Alain Vigneault, whose in game adjustments remain mystifying. With his D clearly having problems with Buffalo’s team speed, he never once changed his D pairings. That left McDonagh with Girardi. It was a long night for them. He also only played third pair Brady Skjei and Clendening 14-plus minutes. They were more effective as was Staal and Holden. When the game was tied, the Sabres came very hard. Let’s just say the ice was tilted. The Rangers spent the rest of the second on their heels. With the lone exception of one good shift from Kreider and Jesper Fast, they were outgunned. Kreider delivered a big hit to free a puck loose to Fast, who in turn fed a pinching Staal for his second goal this season to give the Rangers a 3-2 lead headed to the third. In it, it was all Buffalo who held a 12-5 edge in shots along with territorial control. A Clendening rough on Eichel which somehow was called a hold led to Eichel’s tying power play goal with 7:15 left. Taking a feed from Kyle Okposo, he cruised through the Ranger zone and took his wrist shot fooling Lundqvist thru the wickets. It was a hard accurate shot but stoppable. Then came the Girardi hiccups with everyone out of position including the goalie and Zuccarello, who may as well have not been on the ice. Eichel got the nice bounce which was deserved for his third goal in two games since returning. He looks even better. As for the Rangers, they might want to consider keeping Clendening in for tomorrow’s game against Carolina and sitting Girardi. But that’s up to the coach. We’ll see. This entry was posted in Buffalo Sabres, NYRangers and tagged Adam Clendening, Brian Gionta, Dan Girardi, Evander Kane, Jack Eichel, Jesper Fast, Marc Staal, NYRangers, Sabres. Bookmark the permalink.